Ravensburger Games have released a digital conversion of Andreas Seyfarth's San Juan for Android and iOS. San Juan is somewhat of a card based variation of the award winning board game Puerto Rico. 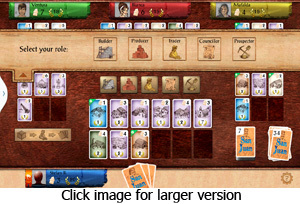 The game features online multiplayer for up to four players on Android and iOS, but reports indicate that this function is not working in the iOS version as of the time of this post. San Juan is available for both platforms for $6.99 (links below). 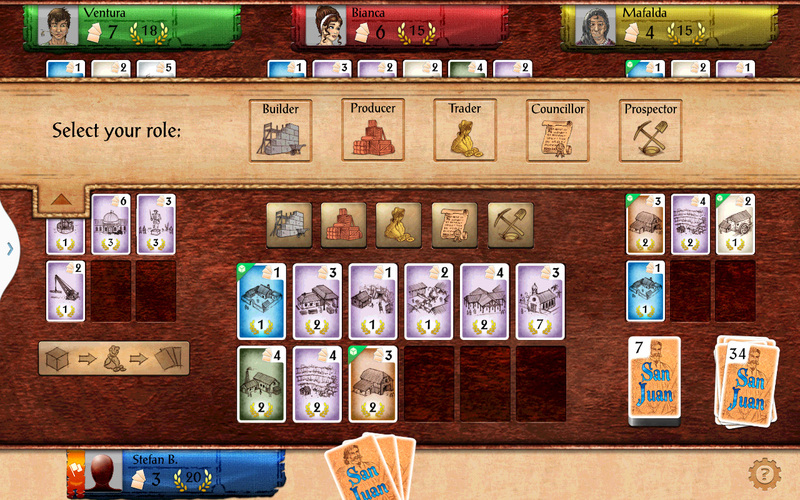 San Juan is a "Role based" game where each turn players select rolls that determine what actions will be available to them on that turn. Players leverage these roles to gain and trade resources in order to build different buildings which yield further bonuses and victory points. Try to out maneuver the opponents and build the most productive and prosperous facilities in the twelve building spots you have available. The game includes an interactive tutorial that is helpful for players new to the game and ai opponents to practice against.